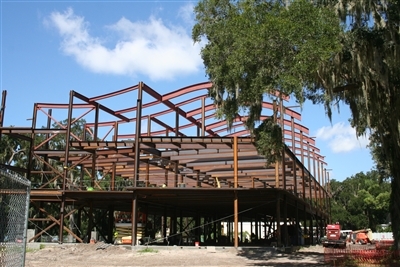 LAKELAND – Students returning to classes this week at Florida Southern College (FSC) are finding a campus under continuing transformation, as a new dance studio with a soaring roof prepares to open and the framework of a new business school is going up fast. The new Becker Business Building is expected to open in 2015. Photos by Susan Green. An outdoor kitchen will begin serving students this month. On the drawing board are a new admissions building and education center overlooking Lake Hollingsworth. And all the projects come on the heels of last year’s construction of a long-shelved Frank Lloyd Wright design that now serves as a tourism and education center. “There’s always so much happening here,” said Terry Dennis, FSC’s vice president of finance and administration, who oversees campus construction with an eye to maintaining architectural integrity. 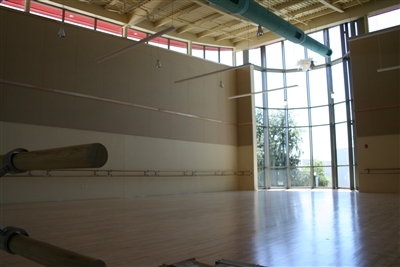 • Work crews are putting finishing touches on the Wynee Warden Dance Studio, which is expected to welcome students in the next three weeks. • The second-floor expansion of the Blanton Nursing Building will be completed in September, bringing an additional 2,500 square feet of instructional space. • The Buck Stop outdoor kitchen and grill, positioned in the heart of campus, will soon be ready to serve cooked-to-order breakfast, lunch, and dinner al fresco, as well as brick-oven artisan pizzas. • The three-story Bill and Mary Ann Becker Business Building is well underway at the southeast end of campus. The 40,000-square-foot building is slated to open in the fall of 2015 as the new home of the Barney Barnett School of Business and Free Enterprise. 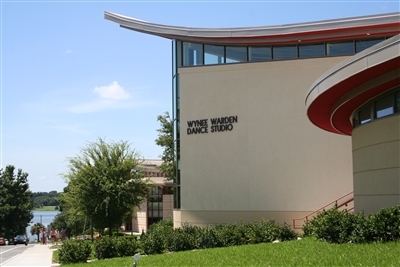 The new Wynee Warden Dance Studio will help Florida Southern College grow its musical theater program and add a dance major track next year. Students will invade the expansive dance floor of the Wynee Warden Studio in the next few weeks. “These additions and improvements, each funded by generous donors, illustrate the college's ongoing commitment to provide an engaging learning environment, one that encourages and supports the spiritual, academic and professional development of our students,” said Dr. Anne Kerr, FSC’s president, in an email to Florida Conference Connection. The new projects continue FSC’s efforts to meet modern student needs while remaining true to the school’s heritage as a campus designed by an American architectural icon. Home to the world’s largest collection of the late Frank Lloyd Wright’s work, the campus was designated a National Historic Landmark in 2012. The new business building, a humanities building completed three years ago and two residence halls over the last five or six years were all created and designed by Robert A.M. Stern, dean of architecture at Yale University and a student of Wright’s style. 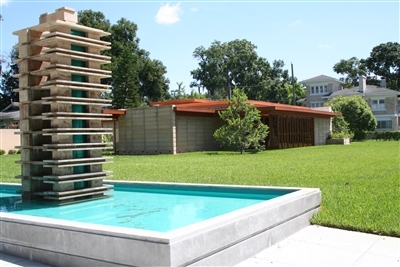 “So his work doesn’t copy Wright but absolutely fits with Wright’s designs,” Dennis said. At the same time, the Becker facility will take “our students from a nice building to a much larger, high-tech building,” said Dennis, noting that the business major program is the most popular at Florida Southern. The three-story, 37,000-square-foot structure will house the Barney Barnett School with state-of-the-art classrooms, as well as a specialized trading room to simulate the environment of a bank or investment company. Bill and Mary Ann Becker are the lead donors for the building, which is due to open in the spring of 2015. Kerr listed the expansion of the Blanton Nursing Building, opened only three years ago, as another example of meeting community and student needs. The improvements will provide additional lab and teaching space for a growing program. “There is a great demand, particularly here in Central Florida, for skilled nurses, so we have not only an undergrad but a graduate program in nursing here,” Kerr said. Wright’s style, described as “organic architecture” that considered its environment, will also be evident in FSC’s new dance studio. A tourist center, gift shop and courtyard pay tribute to the late architect Frank Lloyd Wright. The complex is a recent addition to the Florida Southern campus. Tours of the campus and Wright Usonian house are available. The 4,700-square-foot studio houses faculty offices and dressing rooms and features a soaring glass half-rotunda that allows natural light to illuminate the dance floor. The studio is named for Winifred “Wynee” Warden of Orlando, a Florida Southern benefactor. Dr. Kyle Fedler, FSC provost, said the new space will provide a boost to the school’s budding musical theater major, started last year and expected to see an enrollment of up to 50 students in the coming year. The college also has hired a dance director and forged a relationship with Florida Dance Theatre, a professional company in Lakeland, in anticipation of offering a dance major program in the fall of 2015, Fedler said. The program’s focus will be classical ballet, though modern dance and tap will also be offered. Students benefit from FSC’s practice of building as funding becomes available from generous donors, so that tuition can be kept as low as possible, Fedler said. The college is hoping its new tourism center, opened in November 2013, will act as an information station for architectural tourists, who account for about 90,000 visitors a year. Before, tourists would arrive with no clear direction for viewing the work they came to see. The Sharp Family Tourism and Education Center is based on an original Wright design for faculty houses that were never built. Dubbed “Usonian” homes, the structures were part of Wright’s master plan for the campus. But financing was never available for the flat-roof, two-bedroom homes, so the design gathered dust. The oldest private college in Florida, FSC was founded in Orlando in 1883 and serves more than 2,300 undergraduate and graduate students. The school has undergone several name and location changes over the years but always maintained a strong affiliation with the Methodist Church. -- Kevin Brady is a freelance writer based in the Brandon area. Susan Green is the Florida Conference managing editor.